Now taking pre-orders! Supplement to the popular wall calendar, this fun desktop is for our Spoony fans. 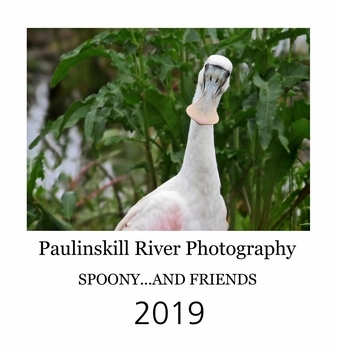 This year a roseate spoonbill visited the Blairstown area, and quickly became a beloved local celebrity. Not normally venturing north of Florida, this was the first time ever a roseate spoonbill was sighted in Warren County, NJ. This calendar celebrates Spoony, along with other rare to our area birds, wading birds, and kindred spirits. There are pictures on both sides of this flip style, free standing easel calendar.